Book Inspired Summer Adventure Ideas! Below are some ideas for a summer adventure, trip, activities or just a fun day out and if you don’t want to or can’t do any of them you can just check out the books that inspired them! I have seen this one all over the place the last couple of weeks getting a lot of press and a lot of great reviews. So I was really excited to read it. In this kind of situation there is really only one question… Does it live up to the hype? Willowdean is happily living her life in Texas with her mother, her best friend and her relatively good job at Harpy’s. She’s is overweight. It was sometimes hard for me to picture Willow in my head. She’s a pretty confident happy go lucky person until two things happen: she strikes up a romance with co-worker Bo and winds up entering in the big town pageant that her mother runs. Willowdean is where the hype works. She’s just an all around great and very relatable character. She loves herself and sometimes she doesn’t. She’s fine with her body and then sometimes she hates it. She loves her family and friends but she’s hard on their weaknesses and flaws. In large part because she doesn’t see them as accepting hers. She’s confident but she also knows the world is cruel. Julie Murphy writes Willowdean very well even the times you don’t like her. She’s also a very funny character quick to crack a joke with a love of Dolly Parton that made me head to iTunes after reading. It falls down a little for me in two parts of the story. First Bo is almost too perfect. He’s like Prince Charming come to life and at the same time I never felt like I knew him which made it hard to really buy into the romance part. Second I wish they had done more with the pageant. It’s a big part of the last half of the book but then kind of tapers out. I really like the girls who compete because Willowdean entering made them brave. I wish they had done more with them. Also despite Willowdean constantly saying it was a big deal that she had entered and her mother saying she wasn’t going to get any special treatment… It really didn’t seem to be. So in the end great main character with a really relatable voice makes the book. This is the second novel of Julie Murphy’s that I’ve read (the first being Side Effects May Vary) and I’m really looking forward to reading whatever comes next for her. Recommend: Yes. It was overall very enjoyable and a nice break from the characters with special powers/hidden royalty stuff that I’ve been reading to much of lately. 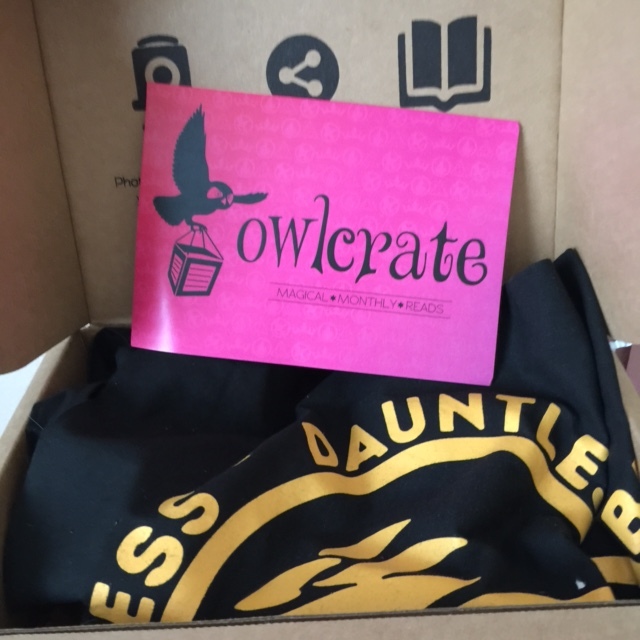 Other Thoughts: OwlCrate Book Subscription First Timer! So I’m a huge sucker for the beauty boxes and I’ve gifted a couple of book boxes before but this was the first time I had some extra money and decided to subscribe for myself. 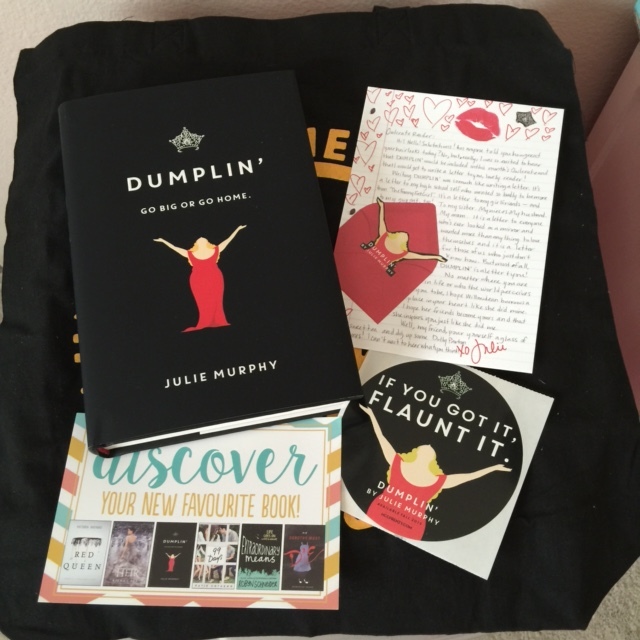 OwlCrate turned out to be awesome timing as it was the fun, fearless women of YA month! Hermione Granger prints (with Crookshanks!) 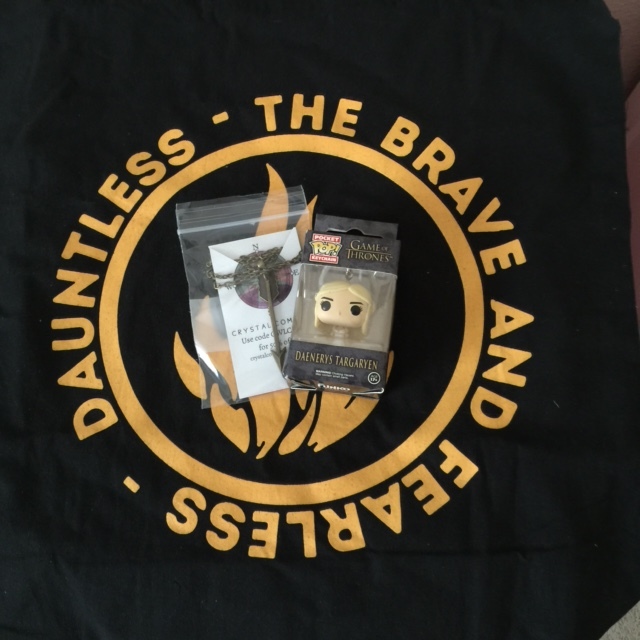 & a Divergent Dauntless tote bag. 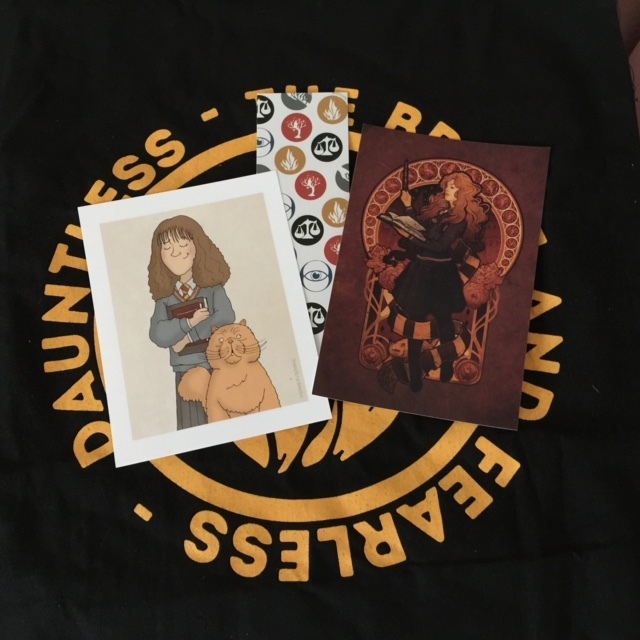 One of the postcards had a 10% discount for a subscription box for cats and the tote bag is really nice quality even though I’m not really into Divergent. The box also included a really nice “arrow” necklace obviously representing Katniss from the Hunger Games. This is from the Crystal Compass shop and again I appreciate the quality. I’ll definitely be wearing it when the last movie rolls around. There was also a little Dany keychain from Pop! 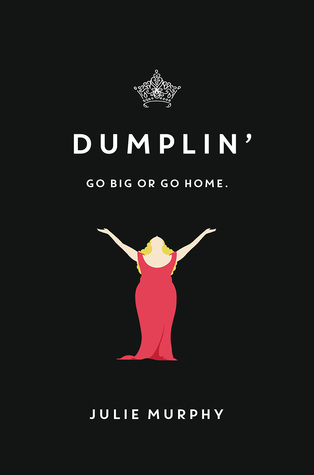 I was honestly thinking/hoping it was going to be Dumplin’ by Julie Murphy. Not only has the book gotten good reviews but it fulfills one of the last squares for the Great Imaginations game. There’s also the sticker and a nice little note from the author. Shipping was fast. I mean it was super quick. I got the box before I got the e-mail saying it had shipped! Plus customer service was on top of things when I had a question and they even followed up! So I must say for this month I am super pleased with the box and will continue through the end of the year at least. So far I think it was worth the money and it’s such a treat getting a beautiful hardcover book in the mail!